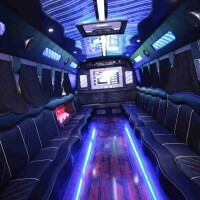 All aboard the Party Bus,> decorated with balloons and streamers, a dance pole and a state of the art sound system for all your favorite sound tracks. Create the ultimate party atmosphere whilst in motion, living the rock star life style. All aboard the Party Bus, decorated with balloons and streamers, a dance pole and a state of the art sound system for all your favorite sound tracks. You have the opportunity to create the ultimate party atmosphere whilst in motion, sipping on complimentary bubbly and living the rock star life style. This is a quality night out with a difference: No nightclub entry issues, no queuing, no walking, multiple clubs in one night - and all in between having a huge party on a bus.